The festival season is about to begin. With prayers for safety and good luck, hundreds of men, women and youngsters will clamor into dragon boats next week to participate in the Naha Haari Dragon Boat Festival. The 32nd annual festival kicks off Wednesday at Aja Port in Naha, building to a Friday crescendo with the main races. 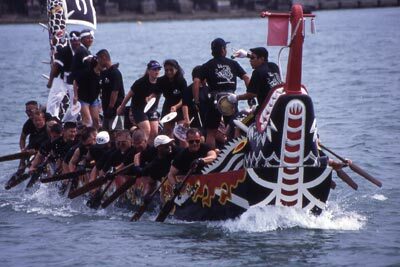 Dozens of 14-member teams will man the oars and stroke their way across the bay to the cadence of the boat masters¹ drumbeats. 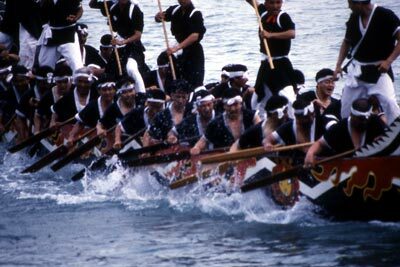 The colorful boats have an Okinawa history, participants in fishermen¹s festivals calling for rain to improve the fishermen¹s luck. 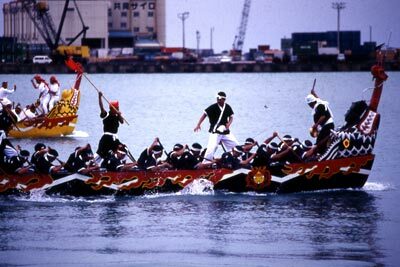 The dragons were thought to lure clouds and rain as they dueled in competition on the water. When the tradition shifted to Okinawa centuries ago, the haari¹s appeal was tweaked as a call for fair weather and good fishing. Opening ceremonies are set for 10am Wednesday at the festival site adjacent to the busy Naha seaport. From the ceremonies and performances on Wednesday, to the final fireworks on Friday the 5th, thousands of foreigners and Okinawans alike will join in the season¹s first major festival. Tuesday¹s activities include a junior high school sumo tournament and brass band performance, adult preliminary haari race heats, stand up comedians, Reina and Asami Yonekura in concert, Taiyofu Orchestra live and Parsha Club live. Fireworks round out the evening. Karaoke, children¹s shows, and entertainment mix with dozens of food and beverage booths and carnival midway games and amusement activities throughout the three days. Thursday events kick off with a Bench Press Tournament at 10am, as well as a Japan Coast Guard Ship open house. A tall ship open house will also be open to the public. There will also be aerobics and live entertainment programs, as well as a Japan Coast Guard maritime safety rescue demonstration. Eisa kicks off the Friday festivities at 10:30am, the same time as Haari main races get under way. Racers don their gear and hit the boats throughout the day, with racers covering a variety of categories, including military teams pitting the U.S. services against each other and the Japanese Self Defense Forces. Entertainment runs throughout the day until 5pm with sanshin and folk songs, followed by a Chinese singer at 5pm. Mami with Noche Canela live is at 7pm, followed by Diamantes lie at 8pm. The Naha Haari final race is at 4:45pm, and fireworks wrap up the festival at 8:45pm. The Naha Haari Festival is free. To reach the festival grounds, travel south on Highway 58 past Camp Kinser, turning right at the Aja Port sign. Proceed west to the main traffic light, where there¹s a big building with a round restaurant on top. Once there, begin looking for signs to parking areas around the docks.